Heart Rate Variability (HRV) is a measure of the minute changes in time between heartbeats. HRV is one of the hottest areas of health and biofeedback research because studies have found that a low HRV is the single most important leading-indicator of heart disease. *Low HRV is a more accurate indicator of impending death from Congestive Heart Failure than obesity, cholesterol or age. Therefore, increasing HRV is the most important preventative measure to reduce the risk of death from CHF. Heart Rhythm Meditation is the most effective way known to increase HRV. No drug has the effect of increasing HRV; this can only be done by breath exercises. We increase HRV by controlling the breath rate to match some number of heartbeats, and then increasing the volume of breath, which is technically called "Vital Capacity." Many benefits result, including the increased ability to cope with emotional stress without physical stress, faster healing, increased learning speeds, and general feelings of well-being. HRM is the only method that actually synchronizes the two fundamental biological oscillators (heart rate and breath rate) because only HRM makes the heartbeat conscious. Even a beginning student of Heart Rhythm Meditation is able to make an HRV instrument register 100% entrainment consistently. In advanced HRM, we also synchronize the brain waves to the heartbeat, giving a three-way entrainment. This has the added advantage of calming the mind and increasing concentration ability. Heart Rhythm Meditation also creates a full breath, increasing lung function, raising the oxygen level of the blood and reducing fatigue. HRM does not cause hyperventilation, a breathing disorder of shallow, rapid breaths, common with stress. Most other forms of meditation can not assure that hyperventilation is avoided. Hyperventilation is known to aggravate asthma, chronic fatigue, angina, spastic colon and pain in muscles and joints. High blood pressure is called Hypertension; it can be caused by stress and it puts you at risk for strokes, heart attacks and renal failure. 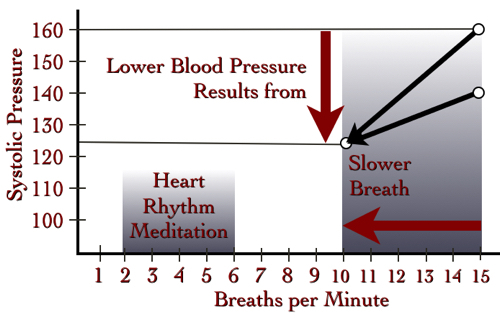 Heart Rhythm Meditation can lower your blood pressure by 36 points systolic and 20 points diastolic. We'll show you how. Heart Rhythm Meditation restores the electrical charge on the cell membrane of red blood cells, which overcomes red-blood cell clumping, called Hemagglutination. 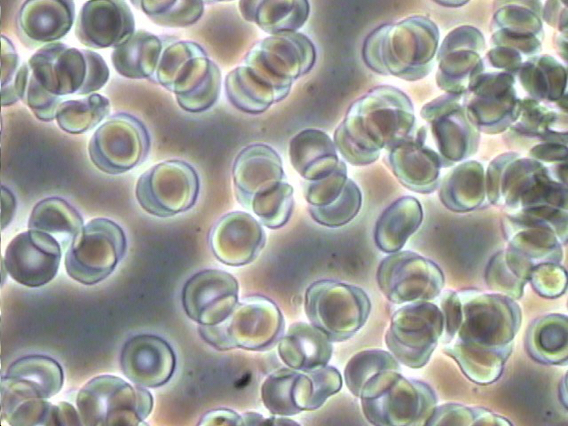 Hemagglutination causes anemia by the inability of the red blood cells to exchange their oxygen with surrounding tissue. Anemia causes chronic tiredness. HRM causes the cells to separate magnetically and thus restores energy levels. The conscious heartbeat and the entrainment of heart rhythm reduces irregularities in the heartbeat and increases the heart's power function, which improves circulation and decreases fatigue. The Thymus gland is part of an expanded heart-center that we focus on in Heart Rhythm Meditation. This concentration on the heart affects the Thymus gland, which creates the T-cells that trigger the immune system. Studies at Harvard have shown that increased immune system function results from heart attention. Central Nervous System Activity (CNA) is increased during Heart Rhythm Meditation, which is the opposite effect of TM and Vipassana meditations. At the same time, Alpha waves are as high as with TM. This causes an alertness with relaxation, a peaceful but energized state. In contrast, a study of TM meditators in Scientific American showed that one-third were actually in a state of sleep with decreased CNA. Heart Rhythm Meditation increases metabolism, similar to a slow-paced exercise. It also improves digestion due to the rhythmic squeezing of the abdominal muscles and lowered stress levels. In Heart Rhythm Meditation attention is placed on the pulse in all parts of the body. The sensation of pulse requires both a strong circulation system, to create the pulse, and a strong nervous system, to return the sensation to the brain. By feeling your pulse in some area you can strengthen your pulse, thereby increasing both the circulation and the nerves in that area, which reduces arthritis and neuropathy. We have seen that sleeplessness is helped by HRM, which makes one adept at changing states of consciousness. Because the full breath of Heart Rhythm Meditation tends to train the unconscious breath rhythm, and since a full exhalation will automatically trigger an inhalation, we have seen that HRM is helpful in the treatment of sleep apnea. Advanced stages of Heart Rhythm Meditation have been shown to greatly increase the light and magnetism of the field around you that's generated by your heart. Visible light is emitted from the chest and can be measured by a photon counter. There is also indication that the physical magnetism of the heart is increased. We see these observable effects as symptoms of the increased power of the heart. We predict that Heart Rhythm Meditation will prove to be effective in treating disorders of the circulatory system, improving recovery time from cardiac operations, and reducing cardiac dysfunction in many ways. We invite such studies and we will provide trainers and subjects. Optimism is the natural condition of a strong heart: the confidence that you can have a greater effect on your world than your world has upon you. Pessimism comes from the wounds that leak the energy of the heart. These wounds can be healed by giving your heart attention and energy: awareness and breath. Speaking from the heart reaches the hearts of others. And knowing your deep feelings gives you integrity and allows you to say the truth. Through contemplation, you have access to the hearts of others. There is a happiness that is beyond pleasure, that does not depend on any reason. Few people know real joy; they mostly live in a narrow band of emotion, carefully controlled. The world is beautiful when we are in our hearts. Your heart is magnetic, and its magnetic field can extend further when you are conscious of your heart. Your magnetism carries your thoughts and feelings. Your peace is literally broadcasted from your heart, helping to create peace in others. The four types of depression are all affected by shifting energy into the heart. Anxiety is reduced through the inner confidence and courage the heart produces. Our practice has been shown to improve the balance between the hemispheres, the absence of which is linked to bi-polar disorder. What will you find when you energize your heart? By embracing your emotion you'll discover an inexhaustible source of power within. You will harness the power of your heart's passion to confront what you need to face, stop self-defeating actions and do what you don't think you can do. In every heart there is a source of profound happiness, a happiness that needs no reason. Your heart opens more and more as it receives your conscious attention, like a flower that opens one petal at a time. As it opens, you'll benefit from deeper relationships, more meaningful work, greater accomplishments, and improved health. As you energize your heart you'll find your greatest qualities: lifelong passion, guidance in all things, a compelling vision of your future, compassion, cooperation, confidence and courage. With the power of your heart you will love your life, appreciate your challenges, be optimistic about your difficulties and bring everyone in your life into your embrace. The next discovery is of your connection to all people, directly, heart-to-heart. Because of this connection you can actually feel in your own heart what another person feels in their heart. This experience of the One Heart, which all share, is an event of enormous importance. Your discovery of it helps blaze a trail that others may more easily follow. Then comes the remembrance of a mission, a purpose for your life that was the reason for your birth. This sense of purpose is imprinted into your heart at its creation and you'll find it when you energize your heart. Your heart makes available its reserve of courage and creativity, a power that is only available to accomplish your heart's wish. All the wonderful qualities of your heart are reserved for, and can be applied to, your unique contribution in life. Your heart's wish is for your completion and full expression of all your talents, gifts and abilities. The path of the heart is not renunciation; it is fulfillment. We are all connected through our hearts, and breath is the bridge between us. With access to your heart, you will never be lonely, as separation is a notion of the mind, not the reality of your heart. Your best guide is beating in your chest. It gives you your sense of what is "right": harmonious, kind, and productive of happiness. Your mind is an able servant of your heart, but mind is directionless when it is left in charge. There is a purpose to your life, the reason for your creation. You can discover it by remembering the mission your heart has held all your life. Your heart was designed for that specific contribution that is yours to make. In its very cells are stored the purpose of its life. This is accessible through Heart Rhythm Practice. Many people who have meditated with insufficient instructions or who have deliberately performed upward meditation techniques such as Kundalini Yoga or samadhi have suffered a variety of neurological problems. Even a single meditation can cause debilitating symptoms that linger for years. These Kundalini problems are not diagnosed currectly by medical doctors, who vainly try to correct them by drugs. The best antidote for Kundalini, even after damage has been done, is the Water Breath, which is taught in the IAM course 102 and described in detail in the book, For more details, see the eBook called "The Dangers of Meditation". It's free.